Bruno Cassirer, Berlin (by 1921), and thence be descent. Possibly T. Natanson, La Revue Blanche, 1 Dec. 1895, p. 498. E. Bernard, Kunst und Künstler, 1908 (illustrated p. 186). K. Scheffler, Talente, Berlin, 1921 (illustrated opposite p. 24). L. Venturi, Cézanne, son art - son oeuvre, Vol. I, Paris, 1936, no. 596, p. 194 (illustrated Vol. II, no. 596, p. 276). A. Gatto, L'Opera Completa di Cézanne, Milan, 1970, no. 785, p. 123 (illustrated p. 122). R. Kendall (ed. ), Cézanne by himself, drawings, paintings, writings, London, 1988 (illustrated p. 186). J. Rewald, The Paintings of Paul Cézanne, A Catalogue Raisonné, Vol. I, London, 1996, no. 802, p. 481 (illustrated Vol. II, no. 802, p. 276). C. Baker and T. Henry, The National Gallery: Complete Illustrated Catalogue, London, 1995 (illustrated p. 108). Paris, Galerie Vollard, Paul Cézanne, Nov.-Dec. 1895. Berlin, Paul Cassirer, Cézanne-Ausstellung, Nov.-Dec. 1921, no. 35. Zurich, Kunsthaus, Französische Malerei des XIX. Jahrhunderts, 1933, no. 87. London, National Gallery (on loan from 1977, inv. no. L35). For nearly twenty years following the third Impressionist exhibition of 1877, Cézanne barely exhibited in Paris. His work was to be seen in only a few places, including the shop of the colour merchant père Tanguy, who had taken canvases in return for painting supplies. Tanguy's shop was a well-known haunt for young artists of the avant-garde, including Van Gogh and Emile Bernard, to whom Tanguy would show his 'stock'. In this way Cézanne's reputation grew amongst the generation of the 1880s, while his reclusive behaviour and frequent absences from Paris meant he remained something of a mythic figure. In this atmosphere of growing curiosity, the young dealer Ambroise Vollard was encouraged by Pissarro and Monet to turn his attention to Cézanne. 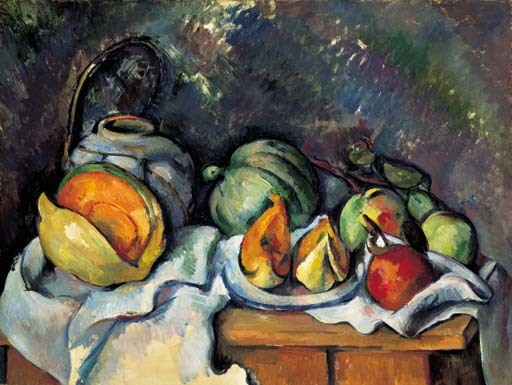 Thus, in the late autumn of 1895, he staged the first Cézanne retrospective in an ambitious show numbering around one hundred and fifty works, in which Nature morte aux fruits et pot de gingembre was exhibited for the first time. The critical reception was mixed. Predictably, there was a chorus of disapproval from the conservative critics; while the vanguard, however, voiced their support. Thereafter Cézanne's retreat in Aix become a place of pilgrimage for the young generation - not always, it must be said, to the master's satisfaction. Perhaps the most telling words on Vollard's show were written by a member of the old guard. Pissarro, Cézanne's artistic 'father' and most stalwart champion, wrote to his son: 'I also thought about the Cézanne exhibition, where there are exquisite things, Still lifes of irreproachable finish, others very worked up and yet left flat, still more beautiful than the others, landscapes, nudes, and heads that are incomplete yet truly grandiose and so painterly, so subtle...Why? The sensation's in them' (letter to Lucien, 21 November 1895, Letters, vol. IV, no. 1174, p. 119). The dating of Cézanne's still-lifes of the 1890s is a notoriously fraught area. The inclusion of Nature morte aux fruits et pot de gingembre in Vollard's exhibition of 1895, though, gives us a terminus ante quem. Consensus is that the present work dates from close to the show itself: Venturi dated it 1890-94, later revising this to 1893-95; Rewald chose a date of circa 1895. Still-life was of crucial importance to Cézanne. As a solitary and methodical worker, it enabled him to arrange his everyday objects in precisely the positions he required, without concern as to the number of 'sittings' involved: once the fruit, pots and tablecloth were arranged to his satisfaction, he was a liberty to record his 'sensations' thoroughly. Still-life was also important for another reason. As perhaps the member of the Impressionist generation most conscious of tradition, Cézanne wished above all to be seen in the context of the old masters and in tackling still-life Cézanne had a guiding light. Jean-Baptiste Chardin's elevation the hitherto lowly genre of still-life was without precedent in the French tradition. His quiet investigations into the painterly possibilities of everyday objects arrayed in modest interiors were enjoying renewed critical interest at the end of the nineteenth century. The acute observation of works such as Le melon entamé (fig. 2), gave Cézanne the confidence to feel that he was not acting alone but within the tradition he so revered. The early 1890s was a period of transition for Cézanne. His so-called 'classical' phase of the previous decade, culminating in the majestic views of Mont Sainte-Victoire across the valley of the Arc (R. 598 & 599), the portraits of Madame Cézanne in the yellow chair (R. 651-653 & 655), the cardplayers series (R. 704-714) and still-lifes such as the Phillips Collection Pot de gingembre (fig. 3), gave way at this time to his final, masterly synthesis of colour and form. Nature morte aux fruits et pot de gingembre is replete with the formal correpondences of the 'classical' period. The arcs of the tablecloth at the lower left, for example, echo the upward sweep of the cut melon and the straw handle of the ginger pot; they are answered at the right by the opposing thrust of the apples' leaves, stems and bunched cloth. Cézanne also ekes out other affinities of form: the right side of the ginger pot is drawn towards to the central melon; the contour of the melon segment at the right is softened, rhyming with the fuller form of the green apple immediately to its right; the lower right tip of the cut melon at the left chimes with the ridge of the tablecloth. Nature morte aux fruits et pot de gingembre is also a particularly resolved composition. In fact, the only substantial portion of the canvas left bare, as in the Musée d'Orsay Nature morte aux oignons (R. 803) and the Hermitage Nature morte avec rideau et pichet fleuri (R. 846), is the lower section of the tablecloth. In its completeness and, moreover, its colour harmonies, the present work relates most closely of all to the Barnes La vase paillé (fig. 4). The two works share a similarly indistinct, modulated background, the same straight-friezed table and the ginger pot, an item from Cézanne's select repertory of objects which made frequent appearances in his work at this time (fig. 5). Nature morte aux fruits et pot de gingembre is also informed with Cézanne's mature colour practice where forms are modelled - and associated with one another - without recourse to traditional light-to-dark tonal gradations. Loaded applications of bright hues of vermilion and green in the upper most apple at the right are juxtaposed at the centre of the fruit, thus acting as a confluence for the prevailing colouration of the two adjacent apples at the right edge. The flesh of the melon at the left is worked with an intricate network of small brushstrokes in a yellow-orange-red sequence, and then outlined in the complementary green. The skin of the melon is painstakingly built up through a series of yellow hues until, at its foremost point, the pink-primed canvas is left bare, recalling Cézanne's statement: 'In an orange, an apple, a ball, a head, there's a culminating point; and this point is always - dispute the tremendous effect: light and shadow, colour sensations - closest to our eye; the edges of objects flee towards a centre placed on our horizon' (letter to Emile Bernard, 25 July 1904, J. Rewald, ed., Letters, New York, 1976). Repeated liquid ultramarine outlines encircle the elements in the paiting and it is evident that Cézanne added some of these outlines after completing much of the composition. See, for instance, the white passage between the cut segments of melon and, again, at the right curve of the plate on which they rest. Here the blue brushstroke runs, wet-on-dry, over the white paint underneath. The seeming uncertainty of this outline gives the appearance of local colours reverberating, existing beyond the confines of their natural boundaries. In many ways this technique anticipates the 'breathing' forms of the later watercolours such as Nature morte avec pasteque entamé (RWC. 564), dated circa 1900, where Cézanne also makes use of the unusual motif of a cut melon. This appearance of pulsing colour is, in the present work, taken up by the weft of background colours - yellow, green, blue, purple - all quoted from the central grouping. Nature morte aux fruits et pot de gingembe passed from the collection of Ambroise Vollard to Bruno Cassirer who, along with his cousin Paul, was amoung the first outside France to recognise Cézanne. The Cassirers had set up an art dealership in Berlin in 1898 and they soon began to take works from Vollard, becoming the first champions of French Impressionism in Germany. Bruno, however, was to concentrate his attention on publishing, setting up the famous publishing house which bore his name. With the same determination and meticulous attention to detail with which marked the house of Bruno Cassirer Verlag, he also set about acquiring an important collection of French and German Impressionist art, including masterpieces by Manet and Monet. Art was Cassirer's lifelong passion, with the guiding principle of his collection being that any acquisition must, above all, bring him joy.